We're all familiar with recycling. Reusing waste to manufacture new products can help resolve two problems: the economic problem of scarcity of resources and the environmental problem of waste. Dedicated bins can help separate waste and collect glass and plastic containers, to be reused in new products. Where needed, surcharges can be levied on items, to ensure they are returned at collections points for recycling. Items such as bottles and car batteries have also been successfully recycled in this way for years by retailers and garages. Recycling is possible for much of our inorganic waste. The concept of recycling can also be used in a wider sense, in efforts to take surplus carbon out of the atmosphere and oceans, e.g. by adding olivine to materials for building and road construction. This effort will require more recycling than the traditional recycling of inorganic waste. Dr. James Hansen once calculated that reforestation of degraded land and improved agricultural practices that retain soil carbon together could draw down atmospheric carbon dixode by as much as 50 ppm, adding that this and using carbon-negative biofuels could bring carbon dioxide back to 350 ppm well before the end of the century. Recycling of organic waste constitutes another cycle in a sustainable economy. Soil can be degraded by deforestation and by a failure to return nutrients, carbon and water to the soil. Manure and sewage have long fertilized the land, but are increasingly released in rivers and in the sea, and combined with fertilizer run-off from farms, this causes low-oxygen areas in oceans. Many people now compost kitchen and garden waste, thus returning many nutrients to the soil. Composting, however, releases greenhouse gases. Pyrolyzing organic waste from households, farms and forests can avoid such emissions. Pyrolysis is an oxygen-starved method of heating waste at relatively low temperatures that will result in the release of little or no greenhouse gases. With pyrolysis, organic waste can be turned into hydrogen and agrichar, or biochar, which can store carbon into the soil and make the soil more fertile. There is an abundance of soil to sequester biochar. Estimates range from 363 tonnes of CO2 per hectare to 303.8 tons C per hectare. The U.S. has some 475 million hectares of agricultural land. Australia has almost 762 million hectares of land, mostly desert. Desert soils can contain between 14 and 100 tonnes of carbon per ha, while dry shrublands can contain up to 270 tonnes of carbon per ha. The carbon stored in the vegetation is considerably lower, with typical quantities being around 2–30 tonnes of carbon per ha in total. Eucalypt trees grow rapidly and eucalypt forest can store over 2800 tonnes of carbon per hectare. The FAO-OECD Agricultural Outlook 2009-2018 says (on page 11) that over 0.8 billion ha of additional land is available for rain-fed crop production in Africa and Latin America. In total, the world has 3.842 billion hectares of land, which could sequester up to 1166 Gt of biochar carbon. The need to feed a growing world population also makes it imperative to look at ways to increase soil fertility. Biochar will result in better retention of nutrients and water. Once applied, biochar can remain useful for hundreds of years. Increased vegetation in many ways feeds itself. It results in additional input for pyrolysis and thus additional biochar. There are also studies indicating that an increase of vegetation goes hand in hand with an increase in rain. Healthy soil will contain numerous bacteria that increase rain, both when they are in the soil where they break down the surface tension of water better than any other substance in nature, and when they become airborne. Furthermore, there are indications that forests generate winds that help pump water around the planet, resulting in increased rainfall for forests. This would explain how the deep interiors of forested continents can get as much rain as the coast. In the 1990s, U.S. farmers needed to implement a soil conservation plan on erodible cropland to be eligible for commodity price supports, and the no-till farmland increased from 7 million hectares in 1990 to 25 million hectares in 2004. Similar policies could be implemented to add biochar, such as making local rates dependent on carbon content. Using published projections of the use of renewable fuels in the year 2010, biochar sequestration could amount to 5.5 to 9.5 Pg Carbon per year, says Lehmann et al. in Bio-char sequestration in terrestrial ecosystems (2006). That would take carbon dioxide in the atmosphere down by about 1ppm per year. In case of energy, there's not so much a scarcity problem of fossil fuel, but a scarcity of clean energy; a rapid shift to clean ways to produce energy is needed, while additionally surplus carbon needs to be taken out of the atmosphere and oceans, as part of a huge recycling effort to restore natural balance. To achieve this, it's imperative to electrify transport and shift to renewable energy. Pyrolysis of organic waste can not only produce biochar (as discussed above), but also bio-oils and bio-fuels for use in transport. Surplus energy (see box on right) can close the energy cycle, resulting not only in clean energy, but also leading to a range of new and clean industries, such as water desalination which could in turn result in the production of lithium for car batteries and magnesium for clean concrete. Electrolyzers can now be made without a need for platinum and there's also interesting research into using electricity to turn seawater into hydrogen. When vehicles run on hydrogen, their output is clean water, rather than emissions. A rapid shift to clean energy and transport would help bring down levels of carbon dioxide, not only by avoiding emissions, but also by making available large amounts of clean energy at times of low demand. As such off-peak energy will be relatively cheap, it can be used for purposes such as capture of carbon dioxide from ambient air. Such technologies can be used to power aviation, to feed carbon dioxide to greenhouses, to produce urea and to supply carbon to industry, e.g. for manufacture of building material, plastic, carbon fiber and other products. Fees on polluting kilns, furnaces, stoves and ovens can also fund rebates on products that avoid emissions, such as clean kilns, efficient electrical appliances, solar cookers, etc. As the number of wind turbines grows, there will increasingly be periods of time when turbines produce more energy than the grid needs. Especially at night, when demand on the grid is at its lowest, there can be a lot of wind. Unless this energy can somehow be stored or used otherwise, it will go to waste. Similarly, surplus energy can be produced by solar power facilities. Especially in the early hours of the morning, just after sunrise, the sun can shine brightly, yet there's little or no need for electricity on the grid. It makes sense to store such surplus energy at solar farms in molten salt facilities. Instead of burning fuel and throwing things away, there are more sustainable ways to do things. Not only are they environmentally more sustainable and healthy, they also provide good job opportunities and investment potential. While some of these technologies are controversial, in that they aren't natural and their consequences aren't fully known, the need to act on global warming makes that they should be further explored. Because many such technologies complement each other, their combination can make them more commercially viable than when looked at in isolation. 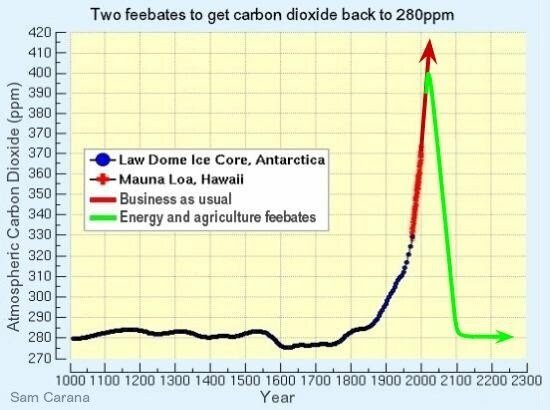 The way back to 280 ppm describes how two types of feebates can help bring down carbon dioxide levels both in the atmosphere and in oceans. 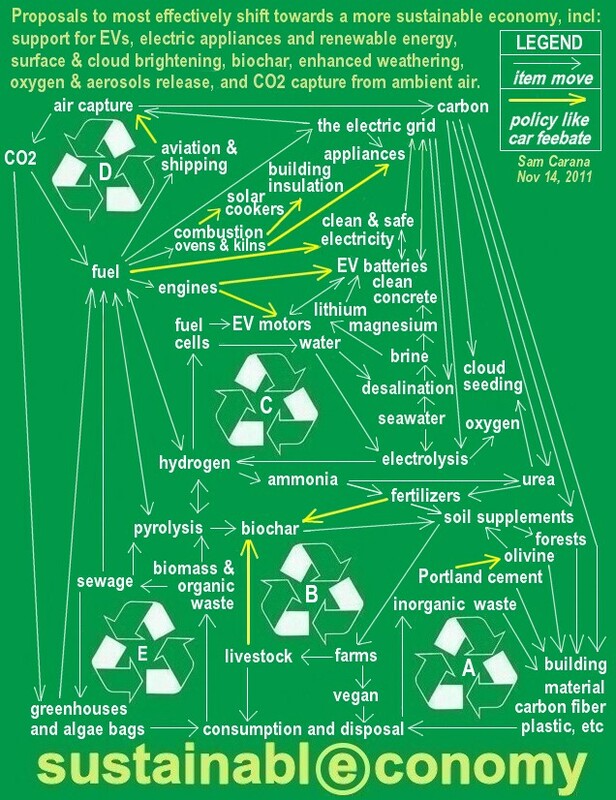 Energy feebates (yellow arrows in the top half of above image) will encourage the use of solar cookers and clean electricity in transport, lighting, cooking, heating and industrial processes, which will also reduce a range of emissions other than carbon dioxide, such as methane and soot. 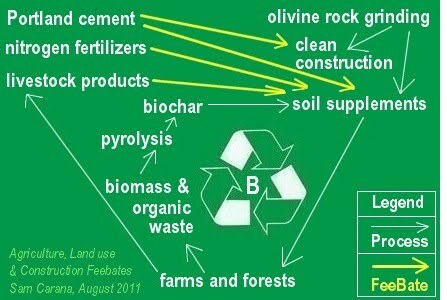 Biochar and olivine feebates (bottom half of above image) will also reduce a range of pollutants. Feebates are the most effective way to facilitate the shift to technologies that reduce greenhouse gases. Energy feebates merely need to insist that the alternatives are safe and clean. Similarly, feebates aiming to have carbon dioxide removed from the atmsophere and the oceans merely need to insist that, to be eligible for rebates, methods need to be effective and safe. Communities can select feebates to suit local circumstances, while allowing market mechanisms to further sort out what works best where. 7. fees on Portland cement, metals, glass, pavement and further conventional construction materials, funding clean construction materials, as described in carbon-negative building and olivine rock grinding. Feebates can be well combined, e.g. feebate 7. and feebate 1. can jointly produce beneficial soil supplements, while pyrolysis of organic waste can also produce bio-oils that can in turn be used to make asphalt and be combined with road construction methds that use olivine. In short, many such feebates are complementary, i.e. one feebate can help another feebate, making the combination even more successful and thus effective. As another example, industry may at first be reluctant to switch to, say, electric arc furnaces in metal smelting, arguing that it was more efficient to burn coal directly in blast furnaces than to burn coal in power plants first and then bring the resulting electricity to electric arc furnaces. But as other feebates facilitate the shift from fossil fuel to clean ways of producing electricity, it increasingly makes more sense to shift from the traditional blast furnaces to electric arc furnaces. Energy feebates, pictured in the top half of the image below, can clean up energy supply within a decade as well as lower the price of off-peak electricity, which will help enhanced weathering and other activities (see boxSurplus Energy). 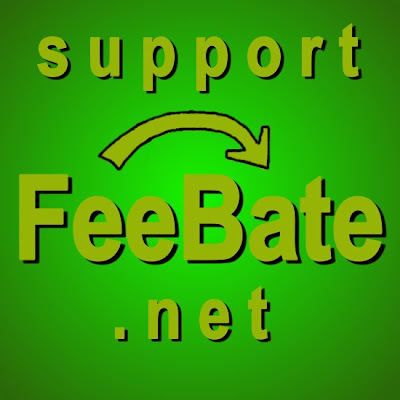 In conclusion, feebates are highly recommended to deal with global warming and to help achieve a sustainable economy. 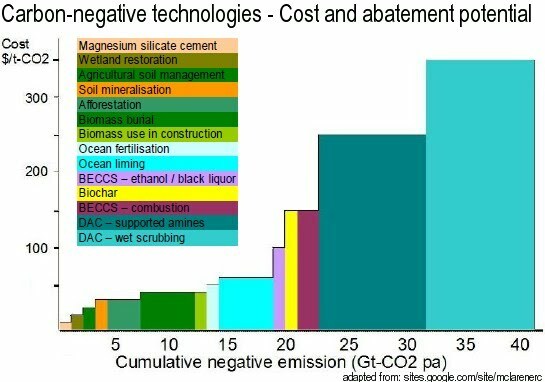 The image below, adapted from Negative Emissions Technologies report by Duncan McLaren (version 2, 2011), pictures a number of carbon dioxide removal (CDR) methods. 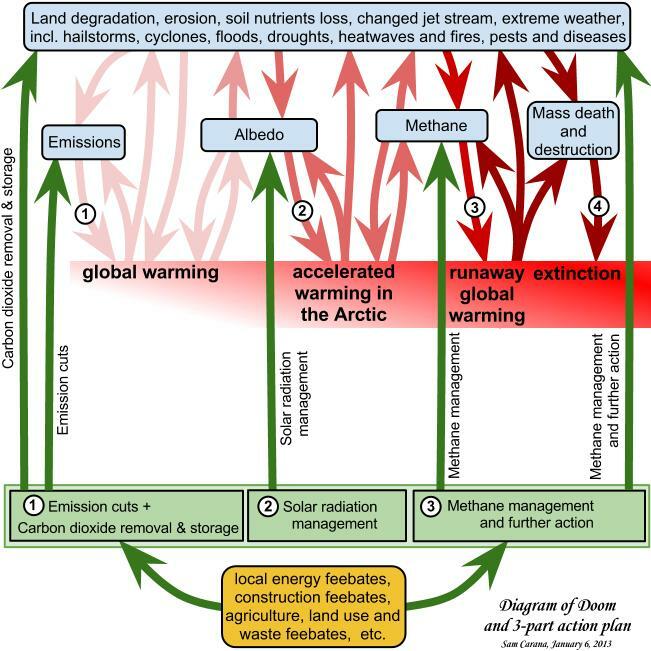 The image below, from Geoengineering the climate, by the Royal Society (2009), pictures a number of geoengineering methods that could be deployed to combat global warming, including both CDR and SRM (solar radiation management) methods. 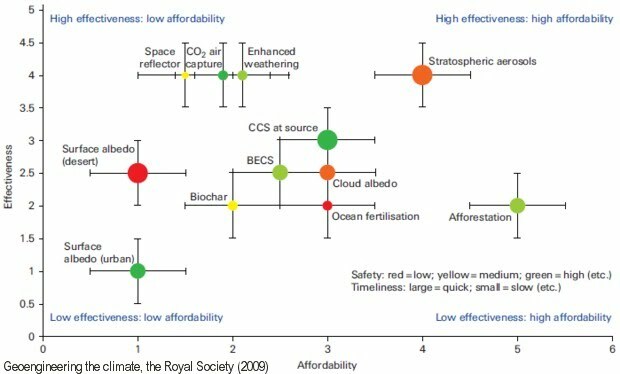 These methods may differ in timescale, cost-effectiveness and wider impact (see e.g. this post on biomass), but the urgency to act on global warming is such that we may well need all of them to avoid runaway global warming and to move towards a sustainable economy.